NCN Lon Teifi Themed TrailLôn Teifi is part of National Route 82 between Aberystwyth and Fishguard. The route takes the same course as the Lôn Cambria route along the Ystwyth valley to Pont-rhyd-y-groes before turning southwest to drop down into the valley of the River Teifi. Follow country lanes and minor roads along the valley of the River Teifi passing through Tregaron, Lampeter, Llandysul and Newcastle Emlyn before reaching the coast at Cardigan. Lôn Teifi is part of National Route 82 between Aberystwyth and Fishguard. 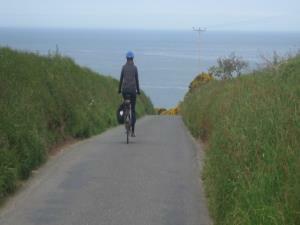 The route follows the river valley where possible but there are several climbs too. Highlights include: Cors Caron National Nature Reserve, waterfalls, Coracle Museum at Cenarth and The Welsh Wildlife Centre.